Austrian conductor born in Salzburg on April 5, 1908 and died in Anif (near Salzburg) on July 16, 1989. It was one of the key figures on the international musical scene in the second half of the 20th century and the first among the directors of this century. He began studying piano in 1912, when he/she was just four, and soon stood out as a child prodigy of the interpretation of this instrument. He/She studied at the Mozarteum and the Salzburg Lyceum, then enter in the Vienna Academy of music, where he/she was a disciple of figures like Franz Schalk and Alexander Wunderer. He made his debut as a professional director in 1929, in Salzburg, in a representation of the Fidelio by Beethoven, and a year later was chosen for a post of director in the German city of Ulm. There he/she remained until 1934, year in which was appointed maestro di cappella in Aachen (Germany), with what became the CEO of younger music of Germany. At the end of the 1930s he/she also recorded their first albums. He/She remained in Aachen until 1941, but he/she sandwiched in that period performances at the Vienna State Opera (which debuted in 1937) and the Opera of Berlin (1938), to be hired as the first director of the latter in 1939 and until 1945. Member of the Nazi party from 1933 until 1942, frequently directed the Paris Opera during the German occupation and, although he/she was exonerated by a court Allied after the second world war, the truth is that for a time banned from directing. His United States debut, also because of its association with Nazism, was surrounded by angry public protests. After leaving Italy in 1944, he/she helped found the London Philarmonia in 1948, year in which made his debut at the Salzburg Festival conducting Le nozze di Figaro by Mozart. From then on he/she received several appointments that associated him with various prestigious institutions, as the artistic director of the Lucerne Festival (1950), director for life of the society of friends of the music of Vienna (1950), director of the London Philharmonia Orchestra (1950), guest conductor for the Bayreuth Festival (1951), etc. In 1955 a major milestone took place in his career, being appointed director of the Berlin Philharmonic Orchestra as a successor of the recently deceased Wilhelm Furtwängler. From 1956 until 1965, he/she was director of the Vienna Opera and, from 1956 to 1960, artistic director of the Salzburg Festival, who returned to take on various occasions throughout his life, especially at the end of his career. He/She was principal conductor of La Scala in Milan, guest conductor of the Philharmonic Orchestra of New York, founded the Salzburg Easter Festival in 1967, and was musical Adviser of the Orchestra of Paris between 1969 and 1970. In 1977, he/she renewed his contract at the Vienna State Opera, but then suffered a nerve problem that prevented him from walking, and that led to reduce their activities for a period of six years. The common thread of his career during these years was the Berlin Philharmonic, which typically remained in the Centre of his musical activities; However, since 1982 a series of disputes led to the estrangement between the members of that Orchestra and Karajan, and the famous director finally resigned from office in April 1989, few months before his death. Despite being a leading figure of 20th-century music, was also noted for being one of the most controversial. Criticized you his relationship with Nazism, his enormous commercial zeal and fanaticism with which embraced certain sounds in the last years of his career, marked preferences when choosing collaborators... Although its musical interpretations always highlighted by its precision and objectivity, it is true that in the seventies and eighties, his address was characterized by to demonstrate a more personal style. However, it is not possible to deny him absolute authority in the execution of the versions of the great German authors, from Bach to Brahms, Bruckner and Mahler; his prodigious memory allowed him to lead without sheet music and had a fascinating attraction on the audience that attended their concerts. All this has earned him popularity with which it is known and occupy a place of honor in the history of music. - Ludwig van Beethoven: Symphony No. 1, Opus 21 in c major; Symphony No. 2, Opus 36 in e major, Symphony No. 3, Opus 56 in e flat major (heroic); Symphony No. 4, Opus 60 in b flat; major Symphony No. 5 in c minor Opus 67; Symphony No. 6, Opus 68 in f major (Pastoral); Symphony No. 8, Symphony No. 7, Opus 92 in mostOpus 93 in f major; Symphony No. 9 in d minor Opus 125. Director: H. von Karajan; soloists: Tomowa-Sintow, Baltsa, Cole, Dam / Wiener Singverein / Berlin Philharmonic Orchestra. DG 429 089-2 (6-CD).- Ludwig van Beethoven: Missa Solemnis opus 123 in d major. Performers: Gundula Janowitz (soprano), Agnes Baltsa (mezzo-soprano), Peter Schreier (tenor), Josef van Dam (bass), Wiener Singverein and Berlin Philharmonic Orchestra. EMI 655-769 246-2 (2 CDs)- Johannes Brahms / Anton Bruckner: Ein deutsches Requiem (Brahms) and Te Deum (Bruckner); performers: Barbara Hendricks (soprano) and Janet Perry (soprano), Helga Müller-Molinari (mezzo-soprano), Gösta Winpergh (tenor), José van Dam (bass) Alexander Malta (bass), Vienna Philharmonic Orchestra and Wiener Singverein; Director: Herbert von Karajan. Deutsche Gramophon, D.G. 410 521-2 (2 CDs)- Johannes Brahms: symphonies 1-4; performers: Orchestra Berliner Philharmoniker; Director: Herbert von Karajan. Deutsche Gramophon, D.G. 429 664-2 (3 CDs).- Johannes Brahms: violin concerto; performers: Anne-Sophie Mutter (violin) and Berlin Philharmonic Orchestra; Director: Herbert von Karajan. Deutsche Gramophon, DG 400 064-2- Richard Wagner: Siegfried: Director: H. von Karajan; performers: Dernesch / Gayer / Domínguez / Stolze / Thomas / Stewart / Kelemen / Ridderbusch; Berlin Philharmonic Orchestra; Deutsche Gramophon DG 415 150-2 (4 CDs)- Felix Mendelsohn: symphonies 1-5; performers: Edith Mathis (soprano) Liselotte Rebmann (soprano), Werner Hollweg (tenor), chorus of the Deutsche Oper Berlin, Berlin Orchestra Filarmoica. Director: Herbert von Karajan. Deutsche Gramophon, D.G. 429 644-2 (3 CDs).- Richard Wagner: Tannhäuser. Director: H. von Karajan; performers: G. Brouwenstijn, Ludwig ch., H. Beirer, E. Wächter, G. Frick, choir and Orchestra of the Opera of Vienna State (1963). Nuova Era 031. 6307/09.3.- Richard Wagner: the master singers of Nuremberg (Die Meistersinger von Nürnberg). Director: Herbert von Karajan; performers: H. Donath, R. Hesse, th. Adam, R. Kollo, G. Evans, K. Ridderbusch, P. Schreier, Z. Kélémen, choir of the State Opera choir of the Radio of Leipzig and Dresden. Dresden Staatskapelle (1970). EMI CDS 7 49683-2.4- Anton Bruckner: symphonies 1-9; performers: Orchestra Berliner Philharmoniker; Director: Herbert von Karajan. Deutsche Gramophon DG 429 648-2 (9 CDs).- Giacomo Puccini: Turandot (selection); performers: Barbara Hendricks (soprano) Katia Ricciarelli (soprano), Francisco Araiza (tenor), Plácido Domingo (tenor), Piero di Palma (tenor), Hans Zednick (tenor), Gottfried Hornik (baritone), Siegmund Nimsgern (bass), Ruggero Raimondi (bass), Niños cantores choir of the Vienna State Opera, Vienna, Vienna Philharmonic Orchestra; Director: Herbert von Karajan. Deutsche Gramophon DG 410 645-2. Gustav Mahler: Symphony No. 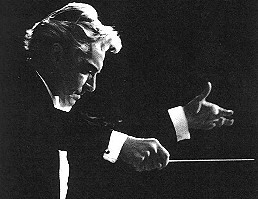 9. performers: Orchestra Berliner Philharmoniker; Director: Herbert von Karajan. Deutsche Gramophon DG 410 726-2 (2 CDs).- Piotr Illich Tchaikovsky: symphonies 1-6; performers: Orchestra Berliner Philharmoniker; Director: Herbert von Karajan. Deutsche Gramophon DG 429 675-2 (4 CDs).- Richard Strauss: Alpine Symphony (Eine Alpensinfonie); performers: Orchestra Berliner Philharmoniker; Director: Herbert von Karajan. Deutsche Gramophon, D.G. 400 039-2- Gustav Holst: the planets; performers: Rias Kammerchor and Berlin Philharmonic Orchestra; Director: Herbert von Karajan. Deutsche Gramophon, D.G. 400 028-2.